Your whiteboarding software - in a browser! Silverfox carries on Xorro's tradition in creating innovative, open whiteboarding software. Silverfox is designed to liberate interactive whiteboard (IWB) users, from the constraints imposed by hardware brands. Now you can use Silverfox to open and edit iwb resources created with other iwb software, and use these on whatever interactive hardware you wish. Best of all: Because Silverfox runs in a browser, there is minimal implementation effort to get started - and no effort at all to keep up to date with the latest versions! Join Xorro or Login for free access to Silverfox! Silverfox provides all of the usual whiteboarding functions: ink, lines, shapes, text, images and media on the canvas. Add new pages on the fly; insert media or draw on pages and relocate pages at will. Our innovative connector tools make concept mapping a snap! Through Xorro-ed, you will be able to find, access and provide feedback on whiteboarding and lesson resources created by educators around the world, as well as upload and share your own activities.. Using Xorro-Q you can involve every member of the audience or class in your questions. Xorro-Q allows you to launch questions instantly and easily, and participants can respond using their own devices (eg cellphones, tablets, laptops etc). Silverfox opens whiteboard content created in 2Touch Workbook (which in turn offers a SMART Notebook transform). Thus using Silverfox you have access to resources created by more than half of the world's interactive whiteboard users. We are working steadily to re-create the superb capabilities of our Workbook whiteboarding software, within a browser-enabled context. That will mean the delivery of our Resource Finder as a web tool and a big focus on integrating Xorro-ed and Xorro-Q into Silverfox. So, Silverfox does the basics – but perhaps does not meet all of your requirements. Perhaps you’d like to discover a powerful whiteboarding solution running on your computer, that emphasises ease of use and customisability, flexible licensing, and most of all – interoperability of file types with other software from leading IWB suppliers? 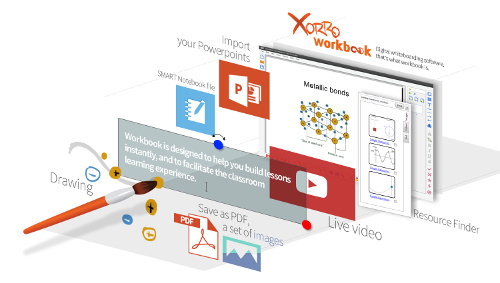 Check out Xorro Workbook: powerful whiteboarding software for use with any interactive surface (Windows only).